Just in time for Easter…Skunk Hollow Publishing reminds parents that Floppidy Loppidy is on duty to guard against springtime sniveling in a fun new holiday tradition. YORK, Maine - March 25, 2014 - PRLog -- Skunk Hollow Publishing is pleased to announce that, while the Christmas elf may be collecting dust on the basement shelf, Floppiddy Loppidy is already hopping to town. The long-eared bunny will be here just in time to save children—and their parents—from cabin fever, and set a cheerful tone for Easter celebrations. 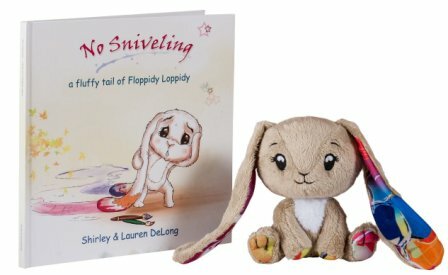 No Sniveling – A Fluffy Tail of Floppidy Loppidy the Long Eared Bunny, is a Skunk Hollow Publishing publication from the mother/daughter team of Shirley DeLong and Lauren DeLong. The book tells the tale of Floppidy Loppidy, a super-sweet bunny with extra-long ears, who struggles to find a way to be a helpful hero for his grandfather, the Easter Rabbit, as he prepares for Easter morning. The story is available as a book or eBook, and is accompanied by a plush Floppidy Loppidy toy. You may purchase books on Amazon.com (http://www.amazon.com/Sniveling-Floppidy-Loppidy-Stuffed-Animal/dp/B00FZVXAK6) and through national retailers as well as direct at www.skunkhollowpublishing.com. And keep an eye out for the next book in the series: No Sniveling, a Fluffy Tale of Beboppidy Loppidy, a sweet, happy bunny who dreams of being a hero like her brother– if only her super long ears wouldn’t get in the way.